Configuration: 5 cards per pack; 6 packs per mini box; 2 mini boxes per box; 8 boxes per case. Inside Each Box: 4 autographs per master box! 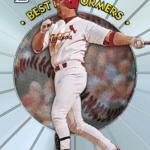 New in 2018, Bowman’s® Best will include 1998 Best Performers Autographs as a case hit! 1 1998 Best Performers Autograph Card NEW! LOOK FOR FOUR AUTOGRAPH CARDS IN EACH MASTER BOX OF 2018 BOWMAN’S BEST BASEBALL, ARRIVING IN DECEMBER 2018. The Bowman’s® Best Base Card set will feature 2018’s most collectible veterans, rookies, MLB ® Draft picks and prospects, on chrome technology. Atomic Refractor: 1 per master box. Purple Refractor: sequentially numbered to 250. Blue Refractor: sequentially numbered to 150. Green Refractor: sequentially numbered to 99. Gold Refractor: sequentially numbered to 50. Orange Refractor: sequentially numbered to 25. Red Refractor: sequentially numbered to 10. All-new insert content will be found in this year’s Bowman’s® Best release! Featuring historic retired greats, elite veterans, top prospects and MLB® Draft picks who have performed well during their careers, on a recreation of the 1998 Bowman’s Best Performers design. 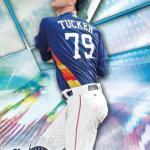 Featuring veterans, rookies, prospects and MLB® Draft picks who have displayed power acumen during their playing time. A colorful, in-your-face design featuring the best-performing MLB® rookie subjects of 2018. Additionally, look for low-numbered autograph and autograph parallels of Power Producers and Neophyte Sensations! 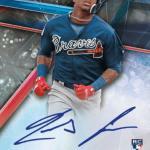 2018 Bowman’s® Best Baseball will contain FOUR autograph cards per master box, featuring a checklist including the year’s biggest veterans, rookies, MLB ® Draft picks and prospects! All Autographs will be ON-CARD signatures! Featuring the top MLB® veterans, rookies, prospects and MLB® Draft picks of 2018. Atomic Refractor: sequentially numbered to 25. 1998 Best Performers Autographs: NEW! An autograph variation of the Best Performers insert. Sequentially numbered. An autograph variation of the Early Indications insert. Sequentially numbered. Showcasing thematically paired subjects with ON-CARD autographs. Atomic Refractor: sequentially numbered to 10. Follow Steel City Collectibles on Twitter @scctradingcards, on Instagram @scctradingcards, & like us on Facebook!Did you know that we have our own logo apparel and accessories? Show your support for the Steel City Scoop by visiting our shop!Don’t forget to listen to the Steel City Scoop podcast! On each episode, we give listeners the Inside Scoop on industry news and product releases while also speaking with experts and representatives from all corners of the hobby!See more industry news here!